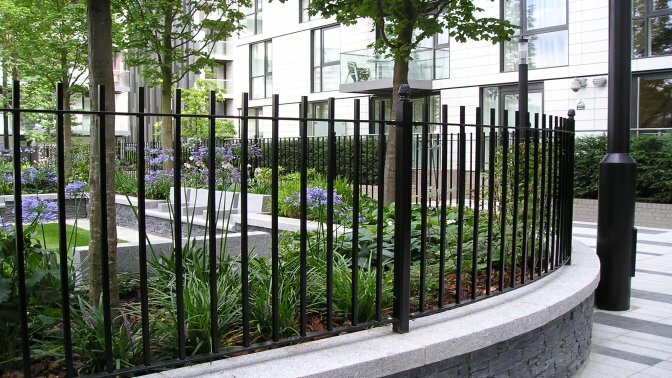 The Alpha Rail installation team have just completed its latest contract to install metal railings at Goodman’s Fields, East London. We are proud to have played our part in this stunning development by Berkeley Homes of a truly unique mixed use 7 acre development in the heart of the City of London. The external development consists of stunning landscaping including a new public park and plaza. Alpha Rail manufactured and installed over 100 linear metres of 1200mm high black powder coated vertical bar metal railings and two 3500mm high bespoke double leaf gates complete with decorative metal arch feature panel above. The wall mounted railing posts featured ‘pineapple’ style finials. Alpha Rail were employed as sub-contractors by Surrey based landscape and building contractor Scotscape Limited. This project has won a British Association of Landscape Industries (BALI) award.